Pardon my ignorance, but how is this aircraft sparkling like this in the photo? Is it a paint job or what? Report submitted by the board of inquiry has been approved. The report recommends strong action against those responsible for the incident. Inspection of boarding bridges installed at all airports also recommended by the report. Implementation of recommendations made in the report has been ordered by Director General Pakistan Civil Aviation Authority (CAA). The report claims that quality of boarding bridge involved in the incident was not good and it was not installed properly. DG Pakistan CAA has ordered initiation of proceedings against boarding bridge manufacturer ADELTE which will also be asked to install replacement boarding bridge without any additional charges. Extension in warranty period by one year for boarding bridges already installed is also sought. Departmental proceedings will also be initiated against a number of Pakistan CAA employees. Poorly trainer employee(s) on contract was/were operating the boarding bridge that crashed. The report recommends that in future permanent employees should be hired for such jobs. "The report claims that quality of boarding bridge involved in the incident was not good and it was not installed properly." Adelte said that they were given an "OK" certificate from CAA after installation. CAA has conveniently put the blame on somebody else. As it is always the case. CAA should maker the report public, let the cause of collapse be known to all, only then the blame on thakedar will have some weight. I feel it would come back in their face. Some insiders told that it was operators fault, as he attempted to brake suddenly at extreme dolly angle?? RAWALPINDI: Two Civil Aviation Authority (CAA) officials will face disciplinary action for negligence in the wake of an inquiry into the collapse of a passenger bridge at the Islamabad International Airport. Mr Baig said that following the committee`s recommendations, the contractor was asked to remove all the defects and shortcomings in its work at Islamabad International Airport using its own resources, including rebuilding the collapsed bridge. He said: `The defect liability period of M/s Adelte has been extended for a year to remove all defects and to rectify the abnormalities in the design.` The inquiry committee also criticized the performance of the design consultant and proposed action in this regard according to the agreement. Inspections of boarding bridges at all airports in the country have also been recommended, along with a stop to the outsourcing of services at airports. The committee has said direct regular recruitment should be made in core areas for all kinds of work at airports. The boarding bridge in question , bridge no.5, collapsed moments after it was disconnected from a Gulf Airways flight on Oct 9, 2018. A four-member board of inquiry was constituted to investigate the incident and determine who was responsible for the collapse. The board was led by CAA Deputy Director General Syed Amir Mehboob, who was assisted by Islamabad International Airport expansion project director Sadiqur Rehman, Bacha Khan International Airport Airport Manager Obaidur Rehman and Bacha Khan International Airport senior director Kamal Khan. What did the inquiry find?, design fault, installation problem, operational error, maintenance lapse or 'qudrat ka likha' ? I think the last one is most appropriate. If there is nothing mentioned in inquiry then probably they will be blaming it to 'Naseeb'. ISLAMABAD: The Civil Aviation Authority confirmed before a parliamentary committee on Wednesday that the passenger boarding bridge that collapsed at the Islamabad International Airport last year collapsed due to a design fault. CAA Director General Hassan Baig told the Senate Standing Committee on Aviation that “the fault was in the design of the bridge - a loose pin”. He said similar design problems were also detected at airports in Peshawar and Karachi. Mr Baig was sharing the findings of an inquiry into the Oct 9 bridge collapse, which injured two staff members. After the bridge collapsed, Emirates refused to use passenger boarding bridges citing unsatisfactory safety standards. The Senate committee expressed concerns that other airlines may follow suit. Senators were informed that the warranty period for the bridges, which were installed by a Spanish company, is going to expire in February but will be extended another year. “The Spanish company should be responsible and has been asked to install the air bridge. The company has also been asked to correct the design fault in all the passenger boarding bridges. “Similarly, the project management consultants overseeing the project has also being held responsible for approving the installation of an air bridge with a design fault,” Mr Baig said, adding that remaining payments to the company have been suspended. According to the contract, the CAA is in a position to ask the company that provided the bridge to extend the warranty period, he said. The CAA is now waiting for the company to respond. Mr Baig said these bridges are now being checked nearly every day instead of during quarterly maintenance work to avoid similar incidents. Two senior engineers have also been held responsible by the inquiry and have been issued show-cause notices, he said. Senator Nauman Wazir, who visited the site of the collapsed bridge, told senators at the meeting of the poor standards of maintenance at the airport. While the CAA official insisted a design fault had caused the collapse, Senator Wazir, who met with officials from the Spanish company, said they had refused to accept any responsibility. The company challenged the CAA’s allegations that the bridge collapsed due to a design fault in November. In response to a question from committee chair Senator Mushahidullah Khan, Mr Baig said Emirates has resumed docking at the bridges. ADELTE has refused to accept responsibility for the boarding bridge incident. The boarding bridge warranty is expiring in February. ADELTE has refused to extend boarding bridge defect liability period for one year. Pakistan have British UK commonwealth member and why Pakistan cannot get UK install replacement new bridge? Spanish bridge poor quality but I thought Chinese or Japanese or Germany or USA install bridge good quality? IF Emirates want good bridge then can Emirates install new bridge???? i dont think its fair that we ask other companies to provide their own facilites at international airports in Pakistan. the PCAA is asbolutely useless and are a shame to the country. .......IF Emirates want good bridge then can Emirates install new bridge???? Bridges form same company are installed at emirates hub. 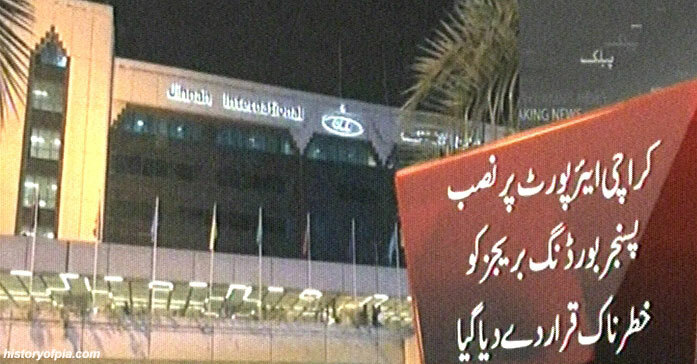 Passenger boarding bridges installed at Karachi Airport have been declared dangerous by a technical committee of Pakistan CAA. The committee has recommended immediate replacement of these boarding bridges. Response from boarding bridge manufacturer ADELTE is sought on January 14. LAHORE - A technical committee of the Civil Aviation Authority (CAA) has declared 27 Passenger Boarding Bridges (PBBs) installed at different airports of the country ‘risky’ for the passengers. An inquiry committee was constituted by the aviation division for the inspection of all PBBs installed at all the airports of the country immediately after collapse of a boarding bridge at Islamabad airport in October 2018. In that incident a passenger was injured but plane of the foreign airline remained safe. A senior officer of the CAA said the report has been submitted to the aviation division and keeping in view the alarming situation of the bridges the government has extended the Defect Liability Period (DLP) of the contractor of the bridges from one year to two years. The technical committee pointed out more than 40 deficiencies in the bridges of the different airports including the need for maintenance and repair of rooftop mounting bolts and rotunda mounting bolts, cabin and tie rods, services stairs, and adjustment procedure of cabin shutters as well as rotunda shutters. The committee directed the Karachi airport management to be extra vigilant to ensure safe operation of the PBBs till the problems are addressed. The report made following recommendations. The tyres or tilting shafts of wheel axle, slewing bearings and crown bearings should be replaced. The gantry frame and it bolts, elevation screw or ACME nut and coupling between elevation screw and gear box are also needed. The contractors (M/s ADELTE) should be approached for immediate redressal of the design issues and defect and deficiencies in the PBBs highlighted in report. Defect Liability Period (DLP) of the PBB’s should be extended if the contractor fails to timely address the defects in the PBBs/systems. The contractor should ensure their regular deployment at the location to address the faults promptly during DLP period. A committee may be constituted for review or reallocation of PBBs parking positions and achieve smooth, trouble free, safe operation as well as to increase structural life of the PBBs. The Pre Condition Air (PCA) units should be shifted on ground. An expert third party assessment may be carried out for this purpose. During making contract documents for design, fabrication and installation of mega engineering systems, at least 1 year maintenance and operation contract with consumable items should be incorporated therein so that in-house manpower could get necessary expertise/OJT for efficient operation and maintenance of specialized equipment afterwards. Also, a third party assessment was recommended for independent evaluation of useful life of the PBBs. For procurement and installation of mega engineering systems, the contractor should be bound for regular deployment of their skilled and technical manpower during the DLP along with sufficient spares. Damages or penalty should be imposed in case the contractor fails to promptly address the defects and faults.